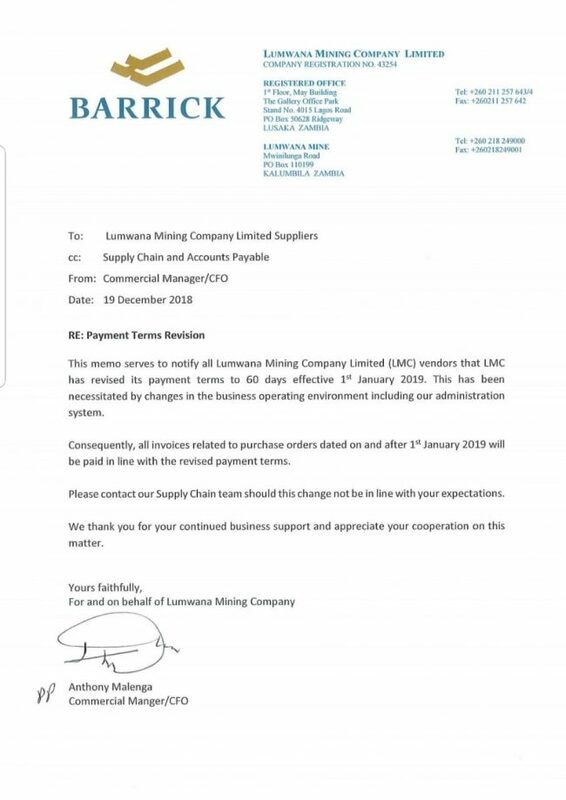 Lumwana Mining Company in Solwezi says it will only pay suppliers after 60 days. Chief Financial Officer and Commercial Manager, Anthony Malenga announced the new measures. Malenga stated in a statement that beginning January 2019, all invoices related to purchases will be honoured only after 60 days or more. This measure will adversely affect mine suppliers, especially small-scale supplier due to the high cost of borrowing money in Zambia and the failure by commercial banks to render credit and supply finance support. Lumwana is owned by Barrick Gold of Canada. Lumwana Mining becomes the second company to implement austerity measures following government budget announcement that it has abolished VAT tax and will implement a universal sales tax to plug inherent loopholes and gaps in the administration of the VAT tax. Last week, First Quantum Mining which owns Kansanshi and Kalumbila mines, announced that it will shed over 2500 jobs due to the new taxation policy.